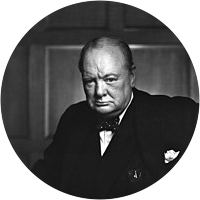 A collection of the best Winston Churchill quotations. A hard-boiled egg of a man. If you mean to profit, learn to please. We shape our buildings, then they shape us. If food is scarce, why isn't Gandhi dead yet? Advertising nourishes the consuming power of men. We are all worms. But I do believe that I am a glow-worm. He is the only bull who brings his own china shop with him. Apt analogies are among the most formidable weapons of the rhetorician. One must regard the hyphen as a blemish to be avoided wherever possible. Broadly speaking, the short words are best, and the old words best of all. The maxim "Nothing avails but perfection" may be spelt shorter: "Paralysis." The further backward you can look, the farther forward you are likely to see. Modern science is standing on tiptoe, ready to open the doors of a golden age. To gain one's way is no escape from the responsibility for an inferior solution. That wasn't a maiden speech—it was a brazen hussy of a speech—a painted tart of a speech. I would like to remind you that without a degree of familiarity we could not breed anything. Relief would do no good. Indians breed like rabbits and will outstrip any available food supply. I cannot forecast to you the action of Russia. It is a riddle wrapped in a mystery inside an enigma. Never give in—in nothing, great or small, large or petty—except to convictions of honor and good sense. Dictators ride to and fro upon tigers which they dare not dismount. And the tigers are getting hungry. I think we shall have to take the Chinese in hand and regulate them. The Aryan stock is bound to triumph. The British . . . are the only people who like to be told how bad things are, who like to be told the worst. What was gunpowder? Trivial. What was electricity? Meaningless. This atomic bomb is the second coming in wrath. I drink a great deal. I sleep a little, and I smoke cigar after cigar. That is why I am in two-hundred-percent form. People occasionally stumble over the truth, but most of them pick themselves up and hurry off as if nothing had happened. A curious sport whose object is to put a very small ball into a very small hole with implements ill-designed for the purpose. He has all the virtues I dislike and none of the vices I admire. Winston Churchill. There, but for the grace of God, goes God. The V sign is the symbol of the unconquerable will of the occupied territories, and a portent of the fate awaiting the Nazi tyranny. The inherent vice of capitalism is the unequal sharing of blessings. The inherent virtue of socialism is the equal sharing of miseries. Criticism may not be agreeable, but it is necessary. It fulfills the same function as pain in the human body; it calls attention to an unhealthy state of things. The surest guide to health, say what they will, is never to suppose we shall be ill; Most of those evils we poor mortals know, from doctors and imagination flow. I shall always be glad to have seen it - for the same reason Papa gave for being glad to have seen Lisbon — namely, that it will be unnecessary for me ever to see it again. I do not want suggestions as to how we can disable the economy and the machinery of war, what I want are suggestions as to how we can roast the German refugees on their escape from Breslau. The oldest habit in the world for resisting change is to complain that unless the remedy to the disease can be universally applied it should not be applied at all. But you must begin somewhere. The oldest habit in the world for resisting change is to complain that unless the remedy to the disease should be universally applied it should not be applied at all. But you must start somewhere. It may also be said that rational, industrious, useful human beings are divided into two classes: first, those whose work is work and whose pleasure is pleasure; and secondly, those whose work and pleasure are one. [Gandhi] ought to be lain bound hand and foot at the gates of Delhi, and then trampled on by an enormous elephant with the new Viceroy seated on its back. Gandhi-ism and everything it stands for will have to be grappled with and crushed. It may be that vengeance is sweet, and that the gods forbade vengeance to men because they reserved for themselves so delicious and intoxicating a drink. But no one should drain the cup to the bottom. The dregs are often filthy-tasting. But the Mahommedan religion increases, instead of lessening, the fury of intolerance. It was originally propagated by the sword, and ever since, its votaries have been subject, above the people of all other creeds, to this form of madness. It may also be said that rational, industrious, useful human beings are divided into two classes: first, those whose work is work and whose pleasure is pleasure; and secondly, those whose work and pleasure are one. Of these the former are the majority. It is alarming and nauseating to see Mr Gandhi, a seditious Middle Temple lawyer, now posing as a fakir of a type well known in the east, striding half naked up the steps of the viceregal palace, while he is still organising and conducting a campaign of civil disobedience, to parlay on equal terms with the representative of the King-Emperor.